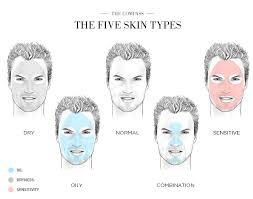 There are four general skin types: dry, oily, normal and combination. In addition, it is possible to have sensitive skin along with one of the four general types. Below are the tips on how to treat your skin type? If your skin has a strong tendency toward dehydration, lacks oil, and has few breakouts if any at all, it is considered dry. In more extreme cases, dry skin lacks elasticity and can be extremely sensitive to the sun, wind, and cold temperatures. Wash your face once a day with a rich, creamy cleanser and warm water. Treatment: Rinse with warm water and pat your skin dry. Use toner to help with that tight and flaky feeling of dehydration. Avoid toners and makeup that contain alcohol as alcohol-based products have a drying effect on skin. Use a cream-based lotion to hydrate your skin and keep it rejuvenated. If your skin is oily, it usually has a lot of shine to it very soon after cleansing and the pores are generally slightly enlarged. It is more prone to pimples, blackheads, and whiteheads than other skin types and is coarser in texture. Treatment: Your skin tends to attract more dirt than dry skin, so wash your face twice a day with a gentle non-foaming cleanser and warm water. Rinse with warm water. Use an alcohol-free, hydrating toner to help remove additional residue. Oil blotting sheets through out the day can help control shine, and it takes as little as 3 minutes after lunch. Although your skin's oily, you still must moisturize it with a light moisturizer daily, or your skin will become dry underneath and overcompensate by producing more oil. Some consider normal skin to be combination skin, but it is not. If your skin is oily in the "T zone" and your nose while dry and taut on the cheeks, it is considered normal. It's also considered normal if it changes with seasons (dryer in winter, oilier in summer). Normal skins can also be 'Normal-To's' as in normal to oily or normal to dry. Treatment: Wash your face with cleansers that are designed for your normal/normal-to skin type. Wipe an alcohol free, hydrating toner all over the face. Apply moisturizer more frequently to dry skin. Combination skin is comprised of two extreme skin types on one face. These situations occur when there is acne and a lot of oil in one area when the rest of the skin is generally dry (no oil). Two common examples are dry skin with papular and pustular acne on the cheeks or a normal skin with inflamed papular and pustular acne in the chin and mouth area. Treatment: Tend to each area appropriately as described above. If the acne is severe, consult a dermatologist or esthetician. Please note that you may have sensitive skin and normal, oily, or dry. If your skin has allergic reactions to beauty products and is usually sensitive to the sun, wind, and cold weather, it is sensitive. Sensitivity can show up in rash, redness, inflammation, acne, and dilated capillaries. Treatment: Look for cleansers, toners, makeup, and moisturizers that are fragrance-free and hypoallergenic. Cleanse, tone and moisturize with gentle products everyday. The idea for your skin is to always choose products with a soothing benefit. Some common ingredients to look for are: chamomile, azulene, bisabolol, allantoin, lavender, camphor, calamine, rosemary, thyme, aloe vera, coconut oil etc. Cold winter air can create havoc for your poor skin and hair. Here are some tips for looking after yourself during the coldest season of the year. This will not only keep you looking good now, but will prevent your skin from ageing prematurely. 1. Wrap up from head to toe. Invest in a warm pair of gloves to protect your hands and prevent the skin on them from becoming dry and flaky. Don't forget to wear a hat as they help protect your hair from drying out and they keep your head nice and warm. Too much exposure to cold, harsh weather can leave hair brittle and dry making it more susceptible to damage. 2. At home, keep warm but not hot. If the temperature inside is much hotter than outside it can irritate your skin and can even cause broken capillaries from the temperature shock when you get home or when you go out. While walking around at home wear slippers or warm socks to prevent getting cold feet which can cause chilblains, which cause your toes to swell, the skin to become sore and sometimes causes permanent disfigurement. 3. Your skin care routine should be adjusted. Skin becomes drier in cold weather, especially if it's windy, because the moisture off the skin is evaporated more quickly by the wind, and the skin doesn't produce as much oil. Try using a slightly heavier moisturizer than you use in the summer, although still make sure that it's suitable for your skin type. Make sure you moisturize every morning, especially if you are going outside, to prevent your skin from becoming dry and flaky. Then at night, before going to bed, wash your face to remove make up and pollutants which could irritate your skin, and apply moisturizer to treat your skin while you sleep. A couple of times a week you should use a gentle exfoliater to scrub away dry skin which can become an issue in cold weather. Tip: MOISTURIZE WITH THE BATHROOM DOOR CLOSED. It maintains the humidity. "Any humectants in your cream can help pull that moisture into your skin". Sunscreen is the real fountain of youth. Get into the habit of applying sunscreen or a lotion with minimum SPF 15 (for dark skin) to 30 (for fair skin) protection daily. Remember that the sun's rays can still be damaging in winter months as it reflects off snow. If you don't like taking the time to put on both moisturizer and sunscreen, buy a moisturizer with sunscreen. 5. Give your lips extra attention to avoid them becoming chapped and splitting. Apply a moisturizing lip balm when you are doing the rest of your skin care, make it part of your routine. As well as this, before you go outside apply some Vaseline/petroleum jelly to your lips as this creates a protective barrier between the cold air and your lips, locking in moisture (remember that Vaseline isn't actually moisturizing, it's only protective, so use another lip balm along side it). The majority of skin cancer is caused by damage to cells from ultraviolet radiation received from sun exposure. The effect is cumulative over a lifetime and skin cancer becomes much more prevalent in the latter decades particularly in patients with a history of multiple sun burns as a child. Skin cancer is very common in our area as many of our older population did not have access to sun blocking agents during their childhood. There are three common skin cancers: basal cell , squamous cell, and melanoma. Basal cell skin cancer does not metastasise (spread to other tissue) except in extremely rare cases and can usually be cured with initial treatment. Squamous cell cancer can spread to other tissues if advanced but is usually diagnosed and treated before this occurs. Melanoma is a dark skin cancer and will spread to other tissues if diagnosis is not done at an early stage and can be difficult to cure with medical therapy and can be fatal . These common skin cancer do have visual characteristics which can be seen on exam and prompt a biopsy. During your fist visit a comprehensive skin examination will be done in addition to examination of any skin growths (lesions)which are of concern to you. Any growths felt to be suspicious for skin cancer will be biopsied and a follow up appointment will be scheduled to review the biopsy results and discuss a treatment plan. A punch biopsy will be done on the majority of suspicious lesions. The area of the lesion will be anesthetized with local anesthetic and a 3 - 4 mm circular core will be obtained and sent for evaluation for cancer (histology). A single stitch is usually placed which will be removed at the next visit ,usually in one week. Dark lesions which are suspicious for melanoma will be completely excised so that the entire area can be evaluated since further treatment of melanoma is based on the deepest extension of growth. Should basal or squamous skin cancer be diagnosed ,the next step is usually surgical excision of the lesion in the office or hospital. Surgical excision will involve removal of at least 5mm of skin on both sides of the lesion to help assure complete removal of all the cancer. This is done using local anesthesia and for larger lesions ,sedation in the hospital out patient setting. Some very superficial cancers can be treated with Aldara or Efudex cream rather than excision. The chance for developing skin cancer can be significantly lessened by reducing exposure to the sun’s ultraviolet rays by using protective clothing and sun block and limiting total exposure time.